SOLE AGENT! 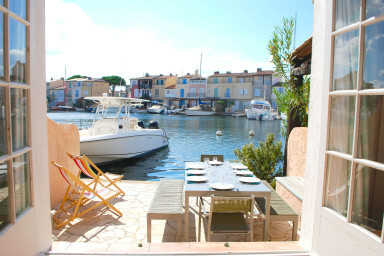 Pretty fisherman house close to the center of Port Grimaud and only 5 minute-away by walk from the beach. At the entrance on the street side, a large East-oriented terrace. On the ground floor, a living-room with an open-plan kitchen. On the 1st floor, 2 bedrooms, a bathroom and separate toilets. On the 2nd floor, 2 bedrooms -including one with a balcony- and a shower-room with toilets. On the canal side, a West-oriented terrace with a beautiful open view. In front of the house, a 16 m x 4,20 m mooring. A house to shape to your tastes!